Back in the 1970s The Brand New Testament would’ve been the kind of film that led to protests and placard holding outside the cinema. The very fact the UK marketing seems to be aping the poster artwork of a Monty Python movie is clearly no accident. The Brand New Testament is a comedy film almost designed to annoy the religious, which is curious because at its core there is actually no explicit attack on Christians or even the practice of religion. In fact one of the most sympathetic characters who appears in it is the unambiguously named JC. Even if he is just a statue on a cupboard. The narrator and hero of our tale is 10 year old Ea, Jesus’s younger sister. She’s a sympathetic enabler, who wants to follow the example of her brother and help people, not annoy them. God is an angry man who guards his creation with sadistic pleasure, keeping the keys to his office fiercely protected. God’s wife is a meek and put upon housewife with a fascination with for embroidery and baseball. They are, miraculous powers aside, a fairly ordinary family dysfunctional family. Ea in act of rebellion makes her way to the human world, to try and gain her own apostles like her brother did, and to get someone to write a brand New Testament to right the wrongs of God’s vindictive rule. God himself follows Ea into his creation via the same Brussels launderette (washing machines are a apparently a magical portal to the ruler of creation) and finds himself a victim of the very rules he created, discovering quite how tricky life is because of them. This is where the broadest humour comes from – and it is a very funny film. But there is a great deal of very beautiful and subtle pieces of whimsy which make up the storytelling of the movie – in fact in visual and narrative style the film The Brand New Testament most closely resembles is Jean-Pierre Jeunet’s Amelie. 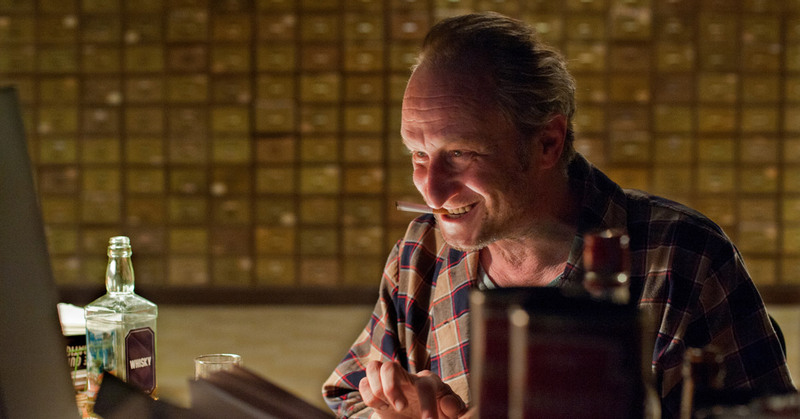 It’s fair to say director Jaco Van Dormael and his co-writer Thomas Gunzig have been influenced by Jeunet’s approach. The characters who make up the new apostles are all alone and broken, and Ea goes out of her way to help fix them. The stylistic quick joke cutaways and moments of tight focus on events of simple delight also share a common palette with Jeunet’s masterpiece, which although instantly recognisable is not to its detriment. The Brand New Testament is a weirdly heartwarming film because of it. Ea, with no frame of reference, thinks that the human world is Heaven. For all its focus on disappointment and disillusion it is a quiet reminder that if you look for it, the world is okay, that not all is bad, that there is joy in the smallest places. A film about loneliness and love becomes a happy story about finding purpose. There is much to enjoy in our world. And that the purpose that these characters find is far removed from religion but without specifically mocking it, shows how ridiculous the arbitrary constructs of worship are. The performances are great, the pacing superb and the gleeful silliness of the storyline never overburdens the film. This is light fun about a serious subject, and is all the better for it. The Brand New Testament is out on DVD now, and is worth a look.